Please go to help>transfer license on your old PC to transfer the license first before activating it in the new computer. After transfer, activate it again on your new PC. If you want to move your software from current computer to a new one (e.g. from Windows PC to Macintosh) or plan to upgrade your hardware, transferring license should be done in advance. This operation deactivates the product on your current machine so it can be reactivated on the new or upgraded computer. Activation Server deactivates the current product and gives feedback to you. Please click help>transfer license on your old PC, it can be finished in a moment. Note: Internet connection is required to transfer license. 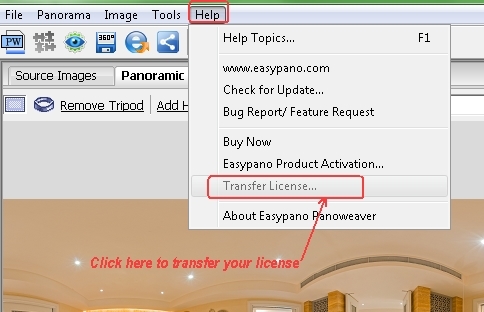 In case you need transfer license offline, say the original computer cannot be accessed or crashed, please directly contact support@easypano.com. An inclusion of your serial number in the email will be more helpful. Easypano support will transfer your license in original computer so that you can reactivate in another one. Tip: Only when the product was activated, can users proceed to transfer license. How to activate Easypano software after reformatting my computer? Why is the EURO price for the software higher than USD price?